Due to travel and work commitments posting will be a little light for a couple of weeks. Who Is The John Galt Corporation? Rand's leftward views on human nature and historical change have already been discussed. What of her leftward views of politics and economics? Reflexively, most would deny any such leftward drift in Rand on these issues. However, in some important respects, such a drift can be espied. Leftist views on politics, economics, and justice generally tend to be collectivist, socialistic, and utopian. Rand obviously detested collectivism and socialism, so she is not leftist in that sense. But she does share with the Left the sort of abstruse utopianism that is prominent among the radical left. This is the kind of utopianism in which one finds the projection of a vaguely conceived abstract ideal society, with all or most of the troublesome, salient details conveniently ignored on various pretexts. Rand's laissez-faire capitalism is a purely mythical, utopian system. It never has, nor ever will, exist. Only those who have no understanding of how things happen in the real world could ever believe in such a phantom. Rand's political, economic, and legal illusions derive mainly from rationalistic prejudice that all problems can be solved through "reason." This is a conviction which the Old Left held at least since the French Revolution but which the New Left has since abandoned. In the Randian form, it assumes: (1) That all (or at least most) social, political, economic and legal issues can be solved exclusively by "reason"; and (2) That all (or most) human beings are potentially rationally, and would be rational if you could only make them understand that it is in their interest to be so. Neither of these assumptions accords with the facts. The reality of the social order is so complicated that no individual mind, regardless of how rational, could ever reason about it with sufficient accuracy to frame all the laws and make all the judicial decisions necessary to maintain a flourishing free market economy. Capitalism cannot exist without the requisite institutional and cultural foundations, most of which require decades—nay, centuries—of trial and error social evolution to develop. The legal institutions that define the uses and limits of private property, for instance, could not possibly be the product of abstract philosophy, guided by reason! Issues of private property are far too complex, being, as they are, wrapped up in the competing interests of various factions and classes. Lawyers played a far more prominent role in the development of free market capitalism than did any philosopher guided by "reason"! Nor are—to cover Rand's second error—men rational in the Randian sense of the word. Rand's whole concept of "reason" is entirely mythical. The faculty Rand describes does not exist! Rand conceives of reason as entirely devoid of both emotion and motivation. Hence her contention that emotions are the mere product of thinking, and potentially can be "programmed" by reason, leading to a complete integration of thought and feeling, where reason and emotion (and, I presume, sentiments and desires) all run on the same track, in perfect harmony. "Emotions are not tools of cognition," Rand further insists, implying that cognition not only can, but ought to be free of emotion. Cognitive science, however, has refuted this cartesian model of thinking, which posits reason as a form of thinking devoid of emotion. Without the appropriate emotional cues, efficacious thinking (i.e., reality-based thinking) is impossible. Consider the strange phenomenon of the idiot savant, who, though capable of tremendous feats of pure mental gymnastics and superhuman calculation, has no judgment about actual facts because the requisite emotional cues are missing. Armed with her false assumptions, Rand winds up making utterly preposterous assertions about society, such her as contention that "once a civilization grasps the concept of law ... common law becomes unnecessary and should not be regarded as law [because "reason" provides a better guide than established usage]" or her equally absurd contention that having respect for tradition "means that we must accept the values other men chosen, merely because other men have chosen them." It is clear that Rand's mistaken notion of human reason blinded her to the value of tradition. Respect for tradition is based, not on any kind of irrational esteem for one's ancestors, but on (in Hayek's words) "the insight that the result of the experimentation of many generations may embody more experience than any one man possesses." "There is a hereditary selective advantage to membership in a powerful group united by devout belief and purpose. Even when individuals subordinate themselves and risk death in common cause, their genes are more likely to be transmitted to the next generation than are those of competing groups who lack equivalent resolve. Because of her uncompromising espousal of individualism and capitalism, Rand is usually identified with the right, rather than the left. Indeed, her intellectual heir, Leonard Peikoff, has gone so far as to describe himself as "to the right of Attila the Hun." Nevertheless, in at least two crucial areas of thought, Rand's views are much closer to the left than they are the right. 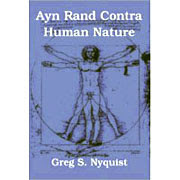 I am referring specifically to Rand's views on human nature and social change. Although there are some important theoretical differences between Rand and academic radical leftism, particularly in terms of economics and social morality, their ultimate conclusions about man and history converge in surprising ways. Rand and the Left both adhere to the belief that human nature is largely malleable--that, in other words, there exists little in the way of innate tendencies of behavior that make certain political, economic, and moral schemes impractical and dangerous. Although they differ in their basic explanations of human behavior (the Left claims that behavior is culturally or socially determined, Rand that it is determined by man's fundamental premises), in the end, their explanations are not so very different. Both Rand and the Left contend that most human beings are governed by ideas or premises or modes of thought and feeling that, in the leftist version, are imposed by the ruling class, or, in the Randian version, are absorbed from intellectuals by the unfocused masses. In either version, ideas, in a very broad sense of the word, are the ultimate determinants of society. For the left, it is the ideas of the ruling or master class. For Rand, it is the ideas of the great philosophical system builders. But in either case, it is ideas that are the means by which social change comes about. Because of Rand's fierce commitment to free will, she tends to downplay the deterministic implications of her theory, in effect declaring that the masses more or less choose (even if unwittingly) to allow themselves to be determined by the predominant philosophy of a given age. The radical Left, on the other hand, because of its obsession with victimhood, emphasizes the powerlessness of the masses to resist the cultural hegemony of ruling class. But their ultimate conclusion is the same: most people, whether by their own free will or not, are determined by the predominant "ideas" in society. And, even more to the point, both Rand and the Left look to the intellectual as the agent of change. The intellectual, guided by philosophers or theorists, can, by challenging the predominant ideas in society, change the entire society. Rand talks about changing people's psycho-epistemology; the Left, about raising people's consciousness. But there really is not much difference in the two phrases. To be sure, Rand and the Left disagree on the type of ideas that trigger social change. Rand believed that metaphysical and epistemological ideas were key. The Left, on the other hand, tends to favor ideas about social and economic relations--though some on the left, particularly those that have bought into post-structuralism and other such intellectual frauds, also are increasingly looking to epistemological ideas in a way that draws strong parallels to Rand. Rand may have disagreed about a lot of specific issues with the left. But on the broad essentials concerning human nature and social change, there isn't much difference between Objectivism and some of the more academic varieties of radical leftism.